These workshops are designed for small dedicated groups ( max 10 ) to learn the art of Woodcarving, Leaf Origami & Pandanus weaving. Participants will interact directly with the artists and should be able to make simple products at the end of the day. Woodcarving would need a longer period of time to achieve a good level of competency. Price includes all tools and materials. Mask carving is an art inspired by the spiritual world of the Orang Asli, a world filled with supernatural forces – both good and evil. Mask makers help visualise. Various folk tales, myths and legends of the olden days are transformed through the masks. 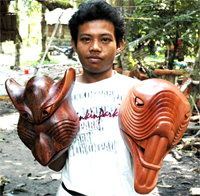 The Mah Meri of the Senoi group is the only group who carves wooden masks. Masks were originally made from Pulai wood, a light weight whitish wood ideal for mask making. Unfortunately, its increasing rarity has caused carvers to use Nyireh Batu wood, a reddish hardwood. The Mah Meri carves masks as a sign of reverence to their ancestors who are regarded as powerful and should be revered. The word “Moyang” used for every mask refers to the ancestors who are believed to be the guardians in safe guarding their peaceful existence and in meeting out punishments. Punishments handed out such as sickness, difficulty in hunting task, failure in planting. Origami is the art of folding paper with the purpose of forming an object by geometric or other ways. Origami originated in Japan in the 16th century ( 1700 – 1800 ) during the Edo period. It was originally prepared for a funerary ceremony ( jibang ) in Korea and in Europe as a bird shaped certificate in Spain ( pajarita ) and France ( cocotte ). Pandanus leaf weaving which have been processed into colored strips is synonymous with the orang asli community. They use pandanus as mats, baskets, pouches, hats, personal adornment and many others. The Mah Meri tribe however use pandanus in many rituals. One such ritual is the welcoming of their honored guests. The welcoming mat is specially woven with special motifs to cleanse the guest’s feet. 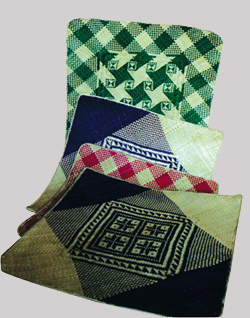 The mat is used once and later given to the person as a souvenir. 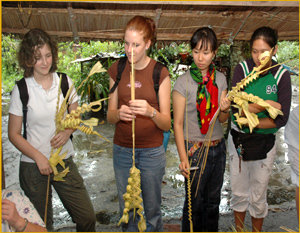 The sungu basket was invented to store rice seeds using the technique known as thorn weaving. The thorns they believe is able to protect the content of the basket.